Our Fall Indy Flourish wedding seating chart mixes both classic watercolors and contemporary flourish elements to give what you see in this example. It features a large, contemporary flourish design at the top of the certificate with a birds and fall leaves painting, and a thick triple line border framing the seating chart. 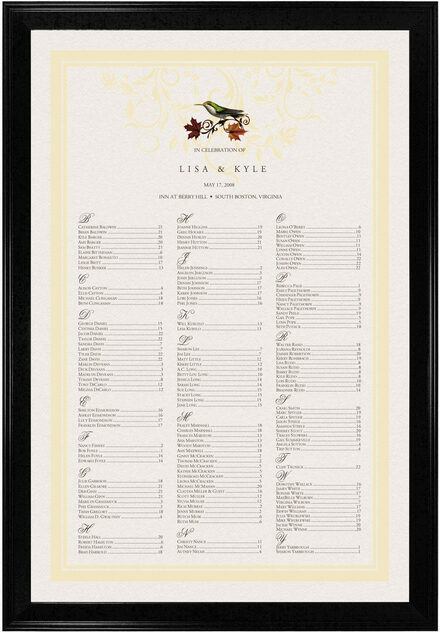 Customize this seating chart with your choice of colors, fonts, and illustrations, as well as by adding your wedding party or your reception dinner menu to the chart.